EPEE -- no ordinary flashlights. SEVEN different Australian Ex approved intrinsically safe flashlights are now available from Montville Creative Products . These are no ordinary flashlights. All have Australian EPEE (explosion protection electrical equipment) approvals and are designed for reliability under harsh industrial conditions. 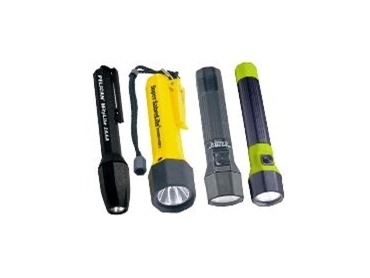 The flashlight bodies are virtually unbreakable, chemical resistant ABS, polycarbonate resin or machined aluminium and are fitted with a high impact polycarbonate lens and a thermoplastic rubber shroud. All are water resistant and some are submersible to 150 metres. The choice of pre-focussed xenon or LED bulbs and lithium or alkaline batteries, provides solutions for a wide variety of applications.